'One day, I’ll own a pretty cottage and it will be in a magazine,’ wrote a teenage Susan in her high school yearbook. ‘I can’t believe it’s actually come true,’ she says today as she looks around the beautiful home she shares with husband Phil, light streaming through the window on a bright and breezy day. ‘I can’t imagine living anywhere else now.’ Yet the journey wasn’t all plain sailing. Find out how they did it, then browse more real home transformations. Find out how to renovate your home, too. Having married in 2013, just a year after meeting on Phil’s US business trip, the happy newlyweds decided in 2014 to settle in England, and Susan left behind her 1860s Folk-Victorian farmhouse in Loganville, Wisconsin. ‘I’m a complete Anglophile so was very excited at the thought of living in the UK, but also a little hesitant, especially about leaving the beautiful home I had spent the last 20 years enjoying and evolving,’ she says. When it came to searching for the perfect property, Susan knew it had to be old, and took the opportunity to hunt out the chocolate-box house of which she’d always dreamed. The couple knew it was going to be hard to find a house to match Susan’s last, and it took over a year of trawling estate agents online to find a shortlist for viewing. ‘It was so difficult to find a period property that retained its original features and matched my four credentials,’ says Susan. ‘I needed a room that I could make into a pantry, a kitchen-diner large enough for my farmhouse table and dresser, a living room with a fireplace and space for floor-to-ceiling bookcases, and outside, I wanted space for a potager, lawn, and greenhouse,’ she explains. A passionate antiques collector, Susan had amassed several pieces of furniture over the years that she couldn’t bear to part with, so this too had to be considered. Happily, all their remote research paid off, as when they stepped into their second viewing Susan knew instantly that she’d found the one. Despite being dark, dated and fitted wall to wall with tired carpets, the house was structurally sound and had been rethatched in 2012. In the meantime, the couple had set to work reconfiguring the space. The previous owners had relocated the kitchen from its original position in the centre of the house and were using it as a dining room, but Susan had other plans. Instead she decided to reinstate the kitchen back into the centre, providing a warm welcome as you walk in, turning the previous kitchen into the dream pantry. She has sought to replicate this style in the country cottage. First came selecting the paint, which proved more problematic than anticipated. ‘My US home was full of light, but these little cottage windows created different shadows, so it was hard to decide on the right colour,’ she explains. Open shelving also makes a brilliant place to store her wealth of antiques. ‘I never miss a boot sale,’ she says. Indeed, everywhere you turn shelves are brimming with vintage finds, cherished books and old china. 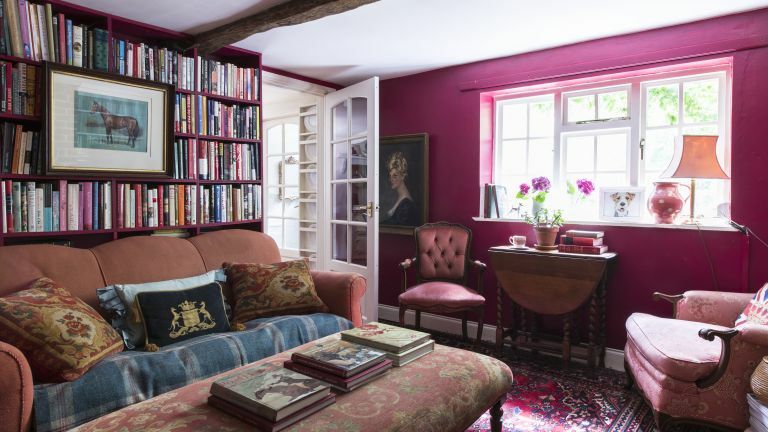 Susan and Phil refreshed the exterior of their 18th-century cottage with a lick of paint, choosing to pick out the doors and window frames in a custom colour mixed from a swatch of Zoffany paint, now discontinued.